"But there's no way we could deport all the undocumented immigrants..."
That's the argument the pro-illegals crowd makes--that there are so many illegal aliens now in the US that there is no feasible way to capture and deport them all. Luckily, if we make it less welcoming, they will take care of the matter themselves. Wake County, NC will begin using the new federal 287(g) program to start deportation proceedings for all illegal aliens passing through their jail. Sheriff Donnie Harrison, who has been criticized by some for his support of the program, said "They're the ones that made the mistake, we didn't. They're here illegally." You tell 'em, sheriff! Of course, we have a long way to go. ICE reports that about 5300 illegals have been processed in North Carolina since the program began in 2006. They also estimate that there are 300,000 illegals in the state. It seems to me that we need to get a lot less illegal alien friendly some more of them will self-deport. How about we cut them off from public assistance next? My tax bill could use a break. 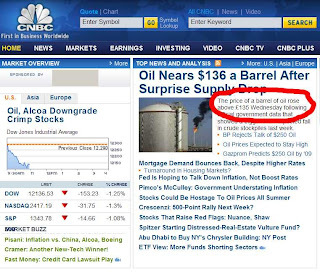 CNBC made a little gaffe this morning. The headline was right, but the text showed the price in British Pounds. I was lucky enough to catch it, and boy did they fix it quickly. A new Transportation Security Agency (TSA) policy will block passengers from flying if they do not have proper ID, but only if they exhibit defiance. Passengers who merely forgot to bring ID will still be permitted to fly, but will be subjected to a physical screening and enhanced baggage screening. Now let me see if I have this right...if I would like to fly without the "Papers, please" business (OK, I know that TSA doesn't say "please"--work with me here), and I just refuse to give them my drivers license or whatever, I'm defiant and won't be allowed to fly. But if I'm Abdul the soon-to-be Dead Terrorist (you know, Achmed's younger brother), all I have to do is say that "Oh my Allah! I've lost my wallet! ", submit to more or the usual ineffective security measures, and I can get on the plane and do my dirty work, then that's cool. Nah, that's not cool, that's f'ed up. Last year in Galesburg, Illinois, five students were denied diplomas from the city's lone public high school after enthusiastic friends or family members cheered for them during commencement. Students could get their diplomas after completing eight hours of public service for the school district. David counsels against jumping to conclusions, and while he's right, I have a case of learned pessimism when it comes to things like this. For now, I guess we continue to wait for more news. Lincoln County Sheriff's officers are searching door-to-door in east Lincoln following a home invasion early Monday. According to a news release, a man and his wife on Catawba Burris Road reported they were awakened by the sound of breaking glass around 2:50 a.m. When they saw a flashlight beam shining under the bedroom door the husband picked up a shotgun. He fired twice after hearing someone grab the door handle. Authorities don't know how many suspects were in the house, but said at least one was wounded by the blast. Deputies followed a blood trail out of the residence, down the drive and a short distance south on Catawba Burris Road. Apparently, this guy had quite a collection by their standards--he even had 15,000 rounds of ammo. Of course, by our standards, that's a few weekends of shooting. The head of the World Health Organization’s HIV/AIDS department has officially admitted for the first time that there will be no global epidemic of the disease among the heterosexual population outside Africa. And it only took them a decade, after it was becoming obvious to anyone who could read a chart that this wasn't going to happen, to come to this conclusion. Isn't science (especially when it's taken over by political correctness and money) wonderful? You have to wonder how long it will take us to get over the global warming hysteria. And while we're at it, I'd also like to predict that The End of Energy (and the associated "We're all going to die starving in the freezing dark" business) is our next outbreak of this sort of panic-driven lunacy. My point is this--all of these things are serious issues. However, you have to actually think clearly and implement long-range plans if you want to deal with them. Having mass demonstrations, passing ill-conceived laws and throwing money at the problems won't solve them.